….Meanwhile at the penitentiary the rival gang is planning another attack against Magda and Lina (Amy) who is now their enemy as well. They are using anti-Arab rhetoric with their co- inmates to stoke the fires of hatred and patriotism following 9/11. Though how could criminals be patriotic too I can’t fathom. . anyway they are able to buy the silence of the other prisoners , who will look the other way. These evil women are plotting to lock up Magda and Lina in the washing room with all the pressure equipment and set fire to that. So while Lina and Magda are quietly discussing what Magda would do once she served her sentence and is free to leave in a few days time, Lina is asking her to take care of Ahmad for her and make sure he is well brought up and loved. They both reminisce about Egypt and the beautiful memories there. Their rêverie is abruptly interrupted by the prison gangsters barging in and starting up a fight. They beat up both women almost to death, with everyone including some prison guards looking the other way, they then set the building on fire and lock the metal doors. The loud explosion brings the chief of prison and the guards to the site and by the time the fire brigade arrives the room where Magda and Lina are locked also explodes with the boilers . So the chief of prison is able to get in only to find two disfigured women wearing the same red overalls, one of them is still barely breathing and he calls her ‘Magda my love’ and asks her to hang on. At this point I was crying and angry and frustrated because although I loved both characters I did not want Lina to end up dead. If one had to die it should be Magda, she did have some kind of history even though she had served her time. I was thinking about what kind of message the producer wanted to imply, was he fed up with the length of the series and wanted to shorten it ? Did he want to be politically correct ? Did he have a fight with the actress? Did he chicken out ? Well Magda it turns out is alive, she is on the operating table and the doctors are looking at photos of her face to repair the damage. They tell her that they will be able to do it and hide most of the scars but her hands are beyond repair, they will get her the motion back but the scars are terrible.. The chief of police is happy since he has the gold locket in his hands now and hopefully Magda will make it. He comes to the hospital to visit Magda and tells her that she will be soon okay and that Lina did not survive. Magda asks him for the locket and he refuses to give it and so she tells him it was Lina’s but that she used to keep it for her ( as we had seen at the beginning of the series). They have an argument and he walks out with the locket. Bakr comes to prison administration to collect the body for burial and Lina’s belongings , he also visits Magda in prison and arranges for her repatriation after she heals since she will be out of prison anyway. He still can’t get to Ahmad and now he has no case since Lina is dead. In a fit of conscience, the prison chief decides not to keep the locket after all since now he knows who its rightful owner is and he hands it also to Bakr. Magda is healing well but her voice is changed because her vocal cords were damaged. The police tell her that when she leaves hospital she must leave the US on the first available flight, she was persona non-grata after she served her sentence. She calls Bakr to tell him this as she is crying that she cannot fulfill Lina’s wish and take Ahmad with her to his homeland. Bakr is drowning in trouble caused by his ex-wife Tracy, who has been dumped and cheated on by her last boyfriend and who in hoping to return to Bakr allows him to put her in an institution for the alcoholic to try and treat her. Bakr who is busy trying to find Ahmad and catch up with Magda about to be deported misses the visitation day with his daughter to Tracy. Leila has to ask her mum’s boyfriend to take her there. When Tracy sees that no Bakr arrived , and that her ex- is with a girlfriend and obviously happy she gets angry and discharges herself from hospital and takes her daughter Leila with her and goes to join this anti-Arab / anti Muslim group and totally prevents her daughter from contact with her dad. Tracy has now lost hope in getting back Bakr and only wants to get BACK at him. Bakr is driving like a demented person to the airport to catch up with Magda, he asks the police escorting her to come in with her and they say no he is not allowed but that he can say goodbye at the entrance for a few minutes. So Magda comes over to him and tells him farewell and he gives her Lina’s locket .She hides it quickly and asks him to find and get her Ahmad, That’s how we find out that it was most probably Magda who died and not Lina. Especially that this girl’s hair is now blonde. Lina (Amy) with the face and name of Magda arrives in Egypt only to be arrested at the airport for the murder of her husband. Lina (Amy) is shocked to find that Magda had fled from Egypt as a suspected murderer so she has escaped the death penalty in the US only to be faced with it back home in Egypt and she is twice innocent. Oh the cruel irony of faith. When push comes to shove at the airport she declares her true identity and tells them she is Lina Adams and not Magda but that a terrible accident happened to her and this is how the surgeon made her face, they ask to prove it , but her fingerprints as we remember are burnt without recognition. So for all purposes she is Magda to the authorities until proven wrong. Her best friend and business partner Marwan is at the airport waiting for her, he is also a lawyer and gets her out on bail. The guy thinks she is Magda and we find out that there was more going on with him and Magda than meets the eye- they were lovers. She tells him that since her accident she has memory loss and cannot always remember every detail. Anyway as soon as she is settled in Magda’s home an old man demands to see her and talk to her in person. She lets him in as she realizes there are many darker aspects of Magda’s life she was unaware off. The guy explains to her that he has her confession on paper that she instigated the murder of her husband and that she has promised to pay him a million Egyptian Dinars to do that during a birthday party. The old man has been waiting all these years along with the lawyer who helped him make this shady deal and he wants his cut now that she is back, she asks him to bring the paper as she cannot remember making this deal at all she says. The old man shows her a photocopy and Marwan confirms it is her signature. So now they need to shut up the guy, because although she is suspected of murder they had never found any substantiating evidence. Meanwhile Lina/Magda is frantically calling Bakr to ask him to help , he gets in contact with the authorities and find they can prove who she really is with dental records just like they do in forensics. Which is what he does, and the authorities are satisfied that she is Lina and not Magda , even though she still has kept Magda’s name and face. 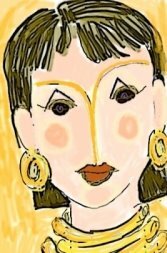 Marwan is not convinced and he tells her that she is the Magda he always wanted to have, the same face and body but with such a caring spirit. But evidently he comes round. With the threat of her imprisonment gone and Magda truly dead they manage to get the old blackmailing man and his partner arrested. Lina is now at least safe in Egypt, and has inherited Magda’s empire which was made before the murder of her husband. On the other side of the world in Margaret’s household we find that she calls Ahmad, Peter and orders him to forget his name was ever Ahmad, we see that John look-alike is being pursued by the mob for debts and he asks Margaret to withdraw the money he put in trust for Peter from the bank because he needs it. She refuses as he already took her share , squandered his and she did not want him to take Peter’s money, as they paid dearly for all that. We find out that he is really John Adams , under a new name, he is a criminal, a thief, a gambler and mafioso, and also he beats Margaret and Ahmad. Back in Egypt Lina contacts her family as Magda, she cannot face them as Lina because of her face. No one recognize her and she gets to check and visits her mum and sister and takes care of them as Lina’s best friend she also informs them that she is trying to get Ahmad out of the US back home. Her mum has a heart attack and needs surgery, her sister Marwa does not want to sign the release papers because it is a very delicate operation. But Marwa does not see the logic that anyway her mum is dying like this so might as well give her a chance. Marwa throws a tantrum and tells Magda ‘she is not your mum anyway’. But Marwa is a little confused because Magda has made some gestures that only Lina used to do when they were kids. Marwa is being arrogant and difficult, until Lina has to given and tell her the truth and prove it to her in many ways. Lina still cannot believe it, but they sign the papers and the mother is saved. Later when she is convalescing they tell her the good news and that restoring her with Magda’s face was the only to save her from an unjust death in America as she needs to live to get her boy and prove her innocence. Her mum tells her that she felt all along that she was her daughter but could not pinpoint exactly or believe it. Things are getting more intense in the US. Bakr is booed and pelted at the political campaign rallies , after all Arabs are very discriminated against after 9/11. Bakr asks the prosecutor that he wishes to clear Lina’s name of the murder and needs to reopen the case. And the prosecutor tells him it is over since she died . Bakr reminds him that they have no body and that there is a guy with John’s face living with Margaret and Ahmed. That he believes in American judicial system and the US Constitution, that he is American and so was Lina by choice and marriage and that she is owed due process even posthumously. The prosecutor tells him to stop bothering him with this case, and that unless he has a valid concrete proof that could stand in court he will not promise anything and he does not want to be involved if this is obtained but it has to be legal. Bakr tells him ‘trust me , as long as I have your promise , you will get your evidence’. Lina tells Bakr she needs to get to the States to be near her son she cannot wait like this indefinitely, maybe she can try to talk to Margaret and convince her to testify and give John to the authorities. The problem is that Lina cannot be resurrected with a death sentence hanging on her head , and Magda cannot get in because she was deported. So they plan to take a risk and smuggle her in through Mexico. Bakr starts immediately with his team to plan this. Margaret has a job and she leaves the child with a nanny. So the nanny is taken care of and Maggie has to look for a new one. Bakr also enlist the help of the mafia boss whom John Adams cheated and who loved Magda very much as she used to work with him before. Alfonso ( the mafia boss) arranges to smuggle Magda ( he does not know she is Lina) via Mexico through his drug gangs. Lina arrives safely in the States and is greeted by Bakr and his team and taken to the city where Maggie ,Ahmad and John are living. She gets interviewed as a nanny after Bakr pulls some strings and is accepted so she stays close to Ahmad and works as the maid and also can search for concrete evidence in the house. Maggie starts to rely on her a lot as Lina is very helpful and good with the boy. Ahmad likes her a lot too and tells her that he is not Peter but Ahmad and that Maggie is not his real mummy , who died but that they are playing a game. Maggie does not wish to yield to John’s demands for Ahmad’s trust fund and she gets beaten and is given an ultimatum. She also catches Lina looking around the house then Ahmad remembers that he had met Magda in prison with his mum and tells his dad and Maggie. John knows his game is up because Maggie can set the record straight in a trial. So he wants to run away but needs to kill Maggie and Magda and get his son who has millions of insurance money in his name. He is armed and dangerous. Lina convinces Margaret to testify and she finds evidence in the house which she hands to Bakr who gets the prosecutor to finally move and grant them a search warrant. Margaret leaves the villa to go and give herself up but is intercepted and killed by John on the way to the police. John owes tons of money to the local sharks again and they are breathing down his neck. John rushes to the villa, and cuts the phone cable. Lina has been waiting for a showdown with him for so long , to find out WHY he did this to her when they loved each other ?, she also needs to clear her name and can positively recognize it is her husband . Him being alive clears her of the murder conviction. So Lina tells Ahmad to run to safety to the villa across the road where team Bakr is camping, and faces John alone. John tells her how much he hates and despise her, that he needs Ahmad because he needs the money right now. He tells her that he had been cheating on her for a long time with other women and her best friend. That he married her because she was something exotic like a forbidden fruit and that it was fun at the beginning but now he got fed up Also that he always gambled etc….and he thought this scheme with Margaret to get the insurance money, it was easy to frame her as she was so gullible. Anyway the police and prosecutor ( who is called McCarthy by the way ) arrive at the scene just as John takes her as hostage. To cut a story short , the prosecutor by now has all the evidence he needs and it is being enacted live before him. John shoots at the police and hits some of them and they retaliate and kill him. While browsing for some info for the projected dating site on this blog ;) , I came accross a hilarious website and could not resist sharing it with you. Basically, if you're dating someone and wish to go one step more in serious mode then you can check him out on this site which hosts photos and info of men who had cheated on their women. i.e.a database of offenders I would say lol . The women get to post here with all the details . So guys maybe you wanna check you are not on THAT list eh ? ..maybe we could start such a website in Libya too ? but I'm afraid to see the results . Anyway check out Don't Date Him Girl "DontDateHimGirl.com is changing the way women date! Browse our search engine of cheating men right now! This controversial site has been featured on MSNBC, the Today Show, ABC News and Entertainment Tonight! Finally, a way for women to check a guy out BEFORE dating, marrying or otherwise committing to him! Warn other women about the men who have cheated on you! ". They even have a blog. The good folks over at the Maghreb Blog ( thanks Adib and Hannibal) have invited Highlander to be a member, and I accepted . However, I'm feeling really embarassed not to have written anything yet . I hope they would forgive me. It's not because I don't want to or am feeling lazy but only because I'm feeling inadequate. I mean it is a fantastic serious blog where I can't just rave and rant like I'm doing here . I need to participate with a good piece, well researched and well written , especially No typos and relevant toour beautiful Maghreb. What is the Maghreb? Well "The Maghreb (المغرب العربي al-Maġrib al-Arabī; also rendered Maghrib or (uncommonly) Moghreb), meaning "western" in Arabic, is the region of Africa north of the Sahara Desert and west of the Nile — specifically, coinciding with the Atlas Mountains. Geopolitically, the area is reckoned to include Morocco, Western Sahara, Algeria, Tunisia, sometimes Libya, and rarely Mauritania. Apropos, the Arab Maghreb Union includes all of the territories listed above except, due to its political status, Western Sahara." ( source Wikipedia). In their own words all the blog authors see side bar 'Auteurs' in the link here on the right say that : "Maghreblog.net est un blog collectif édité par des blogueurs maghrébins qui croient en le potentiel des blogs comme moyen de promotion des valeurs de tolérance, de fraternité, et de dialogue. Maghreblog.net se veut un espace de partage et de débats, et un pont de rapprochement des blogosphères maghrébines. " Roughly translated : It is a collective blog , edited by bloggers from the Maghreb who believe in the potential of the blog as a tool of promotion of the values of tolerance, fraternity and dialogue. Maghreblo. net wishes to be a space for sharing and discussion and a bridge among the Maghrebian ( is that correct?) blogosphere . ( ok shaky translation but I'm sure you got the message) . Please go see what is being discussed there as I'm sure you will find it a bridge not only between Maghrebians but also other cultures and other geographical areas , especially that they blog in Arabic, English, French and even Spanish. Bravo. I'm pleased to be on 'Toot' especially that it came as a surprise to me when they sent an email a couple of weeks ago . Thank you guys. If you are not bored by now and still following please read on. If you are new these are the earlier parts : one, two, three, Olla . Meanwhile ( back to the story ) …. Lina’s best friend Margaret gets temporary custody of Ahmad. Bakr and his team still have a few tricks up their sleeves. In all his interviews and public appearances he insists on being called American (which he would be right ? ) and of calling Lina the ‘American’ wife of John Adams, because the people, press and court continue in calling her lawyer and her as ‘Ayrabs’. So he wants to appeal, or even do a retrial on grounds that there has been mistrial, and ( I’m not well versed in law) inadequate investigative procedures etc… in short stuff not according to the book -which might prove her innocence. 9/11 happens and it is a shock to America! If things had been previously bad for Arabs and Muslims now they are worse. Even his favourite Hindu restaurant is attacked by youth gangs. In prison Lina meets a woman fellow Egyptian convict called Magda who was busted for drug dealing. Magda is the chief of prison’s girlfriend and he grants her protection from the prison gangs. There is a particular female gang in prison who have been a source of constant trouble and they pick on Lina. Lina seeks to befriend Magda who always rebuffs her because she wants no attachment as she is soon leaving prison. During break –time in the courtyard the gang corner Magda and try to stab her with a smuggled knife, Lina jumps in to help and takes the hit instead of Magda. She survives and they become friends. We learn that Magda married a rich Egyptian business man back home whom she used to work for, and that the guy was murdered and that she inherited his business but was arrested for drug dealing on a business trip to the US. She has one brother and a friend who is taking care of her business back home. While in prison her brother ironically dies of a heroin overdose. Lina who is sentenced to death and has no hope of respite decides to appoint Magda as Ahmad’s guardian to take him back to Egypt to his grandmother, since presumably John is dead and she will die soon so the kid will have no family. In an emotional scene they seal the pact and Bakr is supposed to take care of this side. When he tells Margaret to give him Ahmad. Margaret refuses saying Ahmad is hers now and runs away into hiding. After 9/11 the situation towards prisoners of Arab origin (and Arabs in general) becomes even harder, and the public opinion does not help either. So the chief of prison cannot extend his protection to his girlfriend Magda or her protégée Lina anymore. Lina supposedly has kept a gold locket with John’s and Ahmad’s photo with her, so Magda keeps it safely with her because no one dares to touch her (I’m not really sure if in US prison people can keep their jewelry). Because the prison chief loves her, Magda and her buddy get the ‘clean’ chores such as washing the clothes in those big industrial size washrooms, not a tiring dirty job. The other non –Arab girls get the rest of the chores. Announcement, the sidebar has been updated to include the weather forecast and time in Tripoli in addition to another of my favourite hangouts . It's been a week since the allegedly Danish cartoons inspired riots in Benghazi turned deadly last Friday. In Libya the death toll is put at 11 officially confirmed (while others say it is 14), and 69 injured. I will have one final update about this whole thing to close this story. 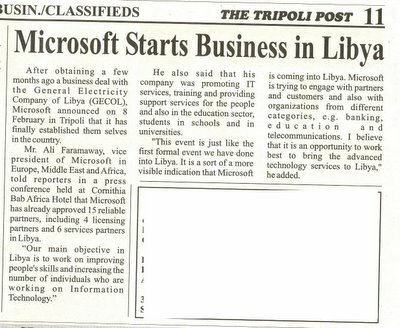 On February 8, Microsoft's Vice President for Europe , ME and North Africa held a presentation at the Corinthia Bab Africa Hotel, Tripoli. Although I was one of the guests I did not make it as I had another appointment. But my friends relayed to me his speech. 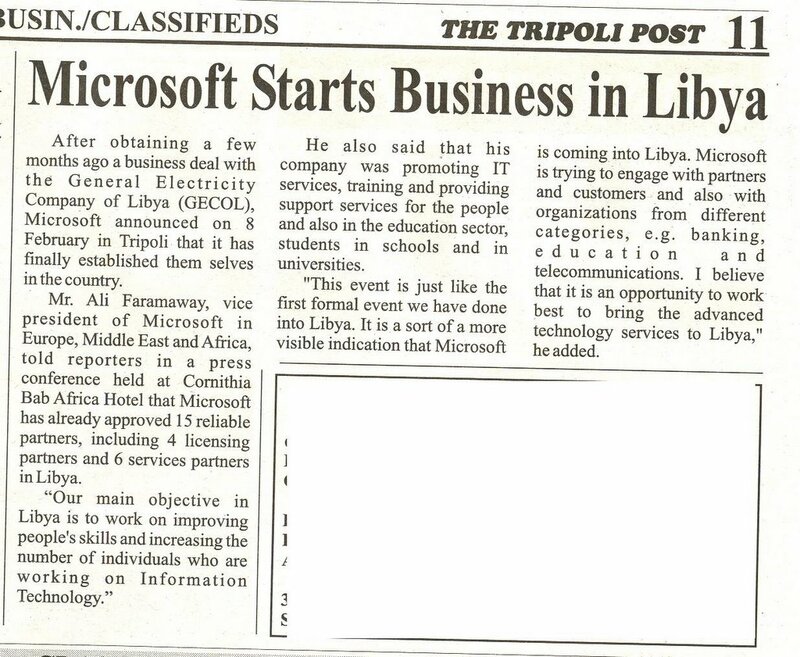 The main point is that 'Microsoft is coming to Libya'. Of course we had Microsoft products before but we bought them from other countries, now it seems among other developments we could import them directly from Microsoft. This is actress Olla Ghanem ( not as I wrote earlier Olla Ramy - sorry Mo it shows I'm so not up to date on the entertainment industry ;) ) and she plays Lina in this series. She is a brunette but dyed her hair blond recently. 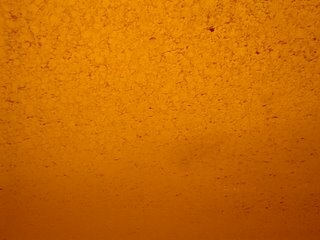 ...this is my car windshield :) and I'm sitting in the car trying to drive ..
Sandstorms are usually a summer occurence in Libya, we call them the Ghibli. Intense heat of almost 60 degrees celcius in the shade, red sand everywhere. It's Thursday here and the weather has been warmer in the last few days. so I was looking forward to a lovely weekend. 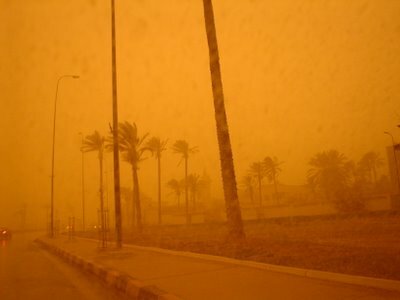 However by 10 am the wind picked up, the sea got rough until by afternoon Tripoli was buried in sand fog, and strong winds. The cars were practically crawling and we had to use the high front lamps and even fog lights. If you drive fast you can get blown over. Then it started raining, big fat blobs. Now the sand is also mud. Tripoli at 3:30 PM looked like it was night. The wind is really strong now and I'm afraid our satellite dish will be blown away this time. The sand is gritty and sticking everywhere, I think the sitting room looks like it has enough sand to make a beach....don't know how we're gonna clean this mess. I'm trying to post this before my telephone line disapears. 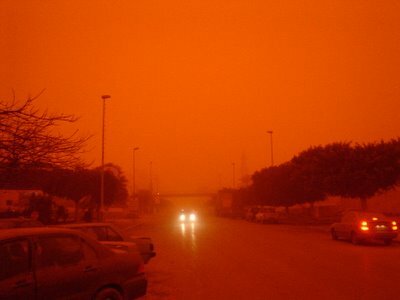 I got some photos for you but I'm not sure you will make out anything :) The red colour is exactly how it is outside. For all those I cannot reach online, I will try as soon as I can. Her : I know you do…( sotto voce oh my God he does ..what shall I do? ) , . Her : ( the guy is serious, do not string him along , be a straight shooter now – oh but how without breaking his heart? – do it now he will heal quicker) - you are catholic we can only marry Muslims. Him: ok I will become a Muslim. Her ( now , scared as she did not expect that ) : can you leave the Church ? won’t you be excommunicated? Have you thought about your parents, how will they accept this? I can never be the cause of an abyss between you and them. Him: I will persuade them, plus I don’t need their permission. Her : true but my faith and yours too teaches us to respect family ties, your mother may curse me, or you can you handle that? ( she is trying hard to put obstacles in his way, if it does not work she will make him hate her so as not to hurt him). Her : this is not right , you have to do it because you feel it and not because you like what you see. ( she needs to get out of this situation- the guy’s gorgeous eyes are searing her soul) - I am sorry this is unacceptable to me, anyway I don’t intend on getting into any relationship just now I still have to finish my studies and that is a long way off in the future. Let us continue being the friends we have always been can’t we do that ? Her : ( looking at him and seeing raw pain, his beautiful green eyes are clouding over and there is a tiny tear forming at the corner, which spills slowly on his cheek- their eyes interlock in a glance which lasts an eternity. She is on the brink of accepting but she cannot make this sacrifice , he surprised her , even though he is ready she is not. She is too young, has no experience ..what if it is a mess . Plus she does not think of him as a suitor , but rather her friend to goof around with . If he continues pleading like this with his eyes her resolve will melt. She breaks eye contact. Their friends in the room sense the tension) Please don’t cry she says. Their favourite song suddenly comes up as if on cue for the last dance ‘sunshine reggae’ . Her : Today I broke a man’s heart – did I take the right decision ? Her Christian friends : that was courageous of you, he will be better off this way you would have ruined his life. Her Muslim friends : that was arrogant of you he was going to convert you would have collected a lot of ‘brownie points ‘ with God and so would he , why did you prevent him from entering Islam? You should have given him a choice and you did not, you took a decision on his behalf and you had no right to that. She never wavered from these self established rules, but *sigh* the characteristic of youth is intransigency. Although the easy part would have been to let him convert on the spot . She did not need to dismiss him totally . She could have put him on the track, shown him the steps and people who could teach him about Islam and let him judge. That would have been fair and just. But that required a leap of faith from her part. Faith that he would like what he saw, understand and stay. Stay for the love of a higher entity first and foremost and second for this mere mortal he professed to love. She did not give him a chance to perform his own leap of faith and now will never know. Those hurt green eyes continue to gaze from space. They say History repeats itself and the wise should open their eyes and mind. Have we learned the lessons? We believe we did and have mellowed out. But in true karmic irony History comes crashing at our feet with a loud bang, and we are required once more to make that leap of faith we had foregone while waiting for a leap of faith from the opposite fence. "انك لا تهدي من أحببت ولكن الله يهدي من يشاء"
Saudi paper publishes the cartoons ? ...and is shut down because of that...that's not the whole story please read here . ( I still can't believe that Sandmonkey has not given us his lowdown on this ). ...….Lina is an Arab and not a Californian bimbo (wink at Programmer_Craig ). The tabloids are depicting gory details, defaming her character, even though she is a naturalized US citizen they keep calling her the Egyptian woman. Her story is very simple, she is a bright girl from Egypt who got a first in science, became a biochemist at home, got a scholarship for a Phd in the US because of her achievements, graduated best of her class in America, embraced the life there and loved the people and got a job offer at a prestigious research centre in LA. So this Arab Muslim woman is handling extremely sensitive material (wink wink). Lina, meets John, an all American charming handsome and successful guy, when he can’t get her into bed with him the usual way , he expresses interest in Islam, converts and asks her to marry him . They live in an affluent part of the city, villa , swimming pool , Suv, Porsche , the whole works. They have one son Ahmad. Everything runs smoothly until John starts to loose in business, and returns to drinking alcohol and it is hinted at even gambling; he dabbles with drug dealers too. Lina is unaware of this until she catches him drinking one day at home and he roughs her up when she tells him to stop acting like a jerk especially in front of the kid. Margaret is witness but takes the kid to his room while John and Lina are shouting at each other. Lina takes the bottle to throw it in the rubbish and John wrestles it from her hand, throws it at the window and accuses her of trying to kill him, just in time for Margaret to be coming down the stairs. He calls the police and files a complaint and a restraining order against Lina. They become estranged. At work also an older scientist colleague of hers who was passed over for promotion levels an accusation at her that she has stolen ‘sensitive weapons grade’ material , which turns out to be a false accusation when all her other colleagues stand up to him with her. Lina has moved out of her marital home to Margaret’s until her husband calms down. A few days later he comes to talk to her , apologises , drops his murder charges and they decide to go on a long weekend together to the chalet on the beach to start again. Margaret agrees to baby-sit. This is the weekend when Lina is arrested. So anyway the tabloids are having a field day with half truths. Lina is in possession of the weapon, blood is all over the place, she already was accused of trying to kill John before. There is only one hitch there is no body. But we are told , that John’s body was thrown from the cliffs the currents must have taken it far and the body must have disappeared. Lina is facing charges of first degree murder with premeditation as we shall see unfold in the trial. The case is becoming a high profile one as the district prosecutor and some other politician guy want this case to be done quickly to get them on track for the election. It seems regardless of Justice her case is to be expedited to a quick death penalty after all it is simple. Lina has no lawyer yet, that’s where Bakr gets in on the story, Margaret calls him and asks him to take care of this case and she will pay for it. He decides to take it after he goes and meets Lina in prison who convinces him of her innocence. Because the case has become notorious now with the politicians taking an active interest and wanting to see her hanged at any cost, and the MSM whipping the issue even more into hysterical proportions, Bakr shoots to notoriety and of course his wife Tracy asks for more money all the time while telling their teenage daughter now that her father is a good for nothing stupid Arab man ( I don’t really know if Americans behave this way but I’m presuming that the author wanted to drive home the atmosphere .. ) . The 'bloody' cartoons encore et toujours ? Each time I say to myself , 'ok that's the end of the story' , but no the ramifications of flames stirred by the Danish caricatures of prophet Muhammad seem to widen once more. My best friend in the US wakes me up at 8 am Tripoli time "highlander is what Sandmonkey is saying true?" . Me "huh?" I'm still in bed ...Sandmonkey is not on my to do list at 8 am ...Ok I'm thinking in a haze of sleep and remnants of a nightmare in which my mother, a brother and one of his kids are on a bus on some kind of weird pilgrimmage in a country obviously under occupation, and I'm holding a vinyl record ( not CD) of the Pink Floyd album "The Wall" ( any dream interpreters out there?). "Well.." says my best friend " the Libyans seem to have burned the Italian embassy in Libya ? 10 dead". Silence from my side , I'm thinking to myself ..what at 8 am they already demonstrated and torched an embassy in Libya ? that was quick. I'm not registering any surprise really, I'm just wondering what happened ..the story was dying out, it had not been that much of a story here anyway on the street at least. Was someone mad at the provocative Italian minister T-shirt campaign ?I thought that guy's publicity stunt to gain exposure for his political career would stir trouble, yes, but not to go burn an embassy. Anyway, I'm still not thinking clearly and answer in monosyllables. Let me collect my thoughts and check the news. I went to bed last night and all was fine in my world. ..
Well true enough , BBC has Libya on its frontpage, and here I was hoping my country will have a low profile for a few days at least. Not a fat chance I guess. Before reading this I thought it was the embassy in Tripoli, so I told my friend I could go have a look later on in the day..but then I learned that it is the Italian consulate in Benghazi; that's over 1000 km far from Tripoli. So for those who sent emails (1) yes it's true and it is all over the news here - I just was not watching it Friday night and went to bed before checking the news again , (2) thank you I'm ok and not in any danger - it is very very far from me (3) Yes Sandmonkey has an interesting theory, but Libya is NOT on 'fire' as he suggests ( hopefully it will not be), (4) if any of you care the situation is calm, the people are in hospital or the morgue, and (5) "The Social People's Leadership of Great Jamahiriya asked the Public Prosecutor to investigate the way police dealt with this incident". Please be reminded that live ammunition was fired by Libyan security at Libyans to protect that building and still the police is going to be prosecuted for any shortcoming if their responses was not strong enough. I am so not going again into the debate about demonstrations , the mob etc.... it will be like going back to the 'start' case. I already said attacking diplomatic missions is not the solution, however, what that Italian MP did was not a way to defuse any situation, if Muslims are supposedly uncivilised then the West should lead by example and show how civilized one can be not taunt the others. If I'm in a dark alley with a thug I have 3 choices go for the kill , try to make him more mad or reach and talk my way out...reaching out needs a noble disposition self control and patience ...some have it some don't. As to why I am not heading the alarmists statements about Libya ? it is because Libya has sacrificed too much to be accepted back into the western fold and America's bossom it is not going to wipe all that in one slash regardless of the histrionics. Please know that we are very very aware of our faults, and only Libyans can solve these problems. Relationships between sovereign countries have a choice of channels , it seems the Italians were willing to use the voice of reason too. Dear Italians attacking the consulate is not how a demonstration should be done and I'm really sorry this happened. So while there should be no excuses for this behaviour I would like to say that this mob separated itself from a larger protest and headed towards the consulate, stopping it required the use of force....again everyone please note that only Muslims have died once more - and this is not newsworthy in the West, the Danish people have nothing to do with this , they are also caught in the middle. I still maintain that this crisis will lead to a dialogue if we are wise enough to seize it. ....Scene two, we have an unaffected lawyer of Arab origin in his bachelor house talking to his pet hamster. With flashback he starts to tell us about how he got to America like many others in his quest for the ‘land of all dreams’. Bakr (or Baker as the Americas call him ) fought in the 67 war with Israel and came back to Egypt a broken man, it took the October war of 73 which ended positively for Egypt to strengthen him out. But he was disillusioned and sought better pastures in America. He was a lawyer in Egypt prior to going to war, so he tells us of his struggle in the states to work and finance his law studies for the bar exam there to be able to practice in the US.He speaks of his great love and devotion for America his adopted country which has opened her arms to him and in which he has finally healed. He is settled, and has married a lovely American (white woman) – Tracy whom he met on campus, and they had a beautiful daughter – Leila. Hmmm but here the idyllic story is broken, Tracy’s ex-boyfriend whom she had dumped when he was drafted to Vietnam and whom she had subsequently been told was dead turns out to be alive… So what does Tracy do. Tracy informs Bakr that her ex-boyfriend Mark is back and she would like to have some time from their marriage off to go live and be with Mark because she thinks she still loves him , she wants to ‘test’ if Mark is still in her system and is she over him or not. Now I think that any sane man or woman regardless of being married or not will agree that what Tracy is asking for is not reasonable, right ? Would you let your husband go live with his ex and be intimate with her in every way possible? I would call that adultery whether a man or a woman does it. In the West people are disgusted by Muslims’ polygamy (which is at least a legal relationship sanctioned by God ) so how could they stand for such a request ? This woman basically wants to go have her fling with her ex and keep the security of being married if the ex does not work out. Having her cake and eating it in a way! So of course what is a red blooded man going to do? being an Arab has nothing to do with it in my opinion but maybe adds more to the drama because of the special attitude of Arabs and Muslims towards the honour of their women. Anyway Bakr gives Tracy an ultimatum, but she does not heed his warning, she dumps him and Leila ( a toddler) and goes with her boyfriend. After she leaves him the court sympathizes and he gets a divorce and custody of Leila. Tracy is even happy to sign the papers giving up her rights to the baby. Meanwhile dear Tracy is gradually disillusioned with Mark who had returned from Vietnam with post traumatic stress syndrome , full of anger and resentment. He has become a woman beater, a drunkard and a bum and she has picked up his destructive alcoholism. One beating too many and she leaves Mark for Bakr asking to be his wife again. Bakr of course is livid and tells her that it is too late as he has gotten over her love and is settled now. She tells Bakr she wants to take Leila then and he says no since she has given up her custody right. She warns him ‘I will fight you in court and get my daughter from you. I will tell the judge/jury that you want to take Leila, an American back to your filthy Arab and Muslim country and dress her in a veil and prevent her from her freedom and keep her in the house and raise her as backward Arab girl. Now let us remember the context in which this threat has been issued : following the Islamic Revolution in Iran (1979), the image of Muslims in the world had been shaken over the years, and the American public had an especially deep grievance with this memory because of the storming of the US embassy and the gruesome episode of the hostage taking that followed. Later on in the 90s movies such as ‘Not without my daughter’ came striking a raw nerve in the collective western psyche. So anyway Bakr weasels out and gives in to Tracy’s blackmail he gives her the daughter and she slaps him with a court order that he should not approach them within a certain distance and gives him very strict visitation rights. Bakr goes on with his life, constantly nagged and blackmailed for money by Tracy every time her various boyfriends dump her , all under the excuse that she needs it for Leila. With this background the years pass , but Bakr is a petty crimes lawyer a bit obscure he deals mostly with immigrants or the less fortunate slices of society. But he has quite a following among these people who ask him to run for Mayor of the city in the summer of 2001. So he takes his election campaign seriously and starts working on it. Meanwhile the local papers are full of a story about the Arab Muslim Egyptian woman who killed her American husband, this is Lina from the opening scene if you recall …. Danish-Libyan blogger , dating sites etc..
Now as for the dating thread started by our one and only Craig who is trying to set up Arab Lover NBA... well maybe we have us a gold mine here :) spreading love ? we can even turn it into a separate link , any ideas are appreciated .. I can do the matchmaking just send the profiles and photos. Also Bad weather = bad phone= no internet : psst keep a secret I live in the outbacks :) so I'm not ignoring you guys , just can't keep up with all this at the cyber cafe. Please continue discussing in whichever thread you fancy . Egyptian Satellite Channel ( ESC) aired a series in Ramadan of last year ( October 2005 ), which I probably would not have noticed immediately had I any choice for Arabic entertainment at that time and place. With hindsight, I’ve concluded that it was meant to be; as this TV series deals with an important issue and was produced to tackle and discuss concerns that our Arab societies have been struggling with in the 21st century. The series ( over 30 episodes ) is called ‘amaken fil alb’, my translation: ‘Places in the Heart’. It is evidently a budget production and is not grand on special effects and such. The plot is not that fantastic either. However, the nature of the topic brings itself front stage and is in line with current events within a social and human context and how world affairs have affected the ordinary lives of not only Egyptians but Arabs in general but more so their American counterparts and by extension the West. I believe there is a deep message in the developing story despite its superficial packaging. In light of the recent events surrounding the so called Danish cartoons which have evolved quickly evolved into a world crisis of economic, diplomatic and social proportions, this story is even more relevant, as it uncovers the tip of the iceberg of our fears (or in this case western fears) of the other, stereotypes, respect, Islamphobia and Arabphobia - but also vice versa I must admit. I think this TV series is important because it has been picked up for broadcast after Ramadan by the MBC Channel which is a very popular pan Arab satellite channel. I’ll recount the story for you - those which have not seen it – and the non –Arab speakers ;). Maybe we can brainstorm the significance of the subliminal message if any. Should I have a reason to be apprehensive? I have forgotten the names of most protagonists except for the 2 or 3 of them so I’ll chose for them names. If one of you has seen it let me know and I will correct them. Dear All, please take time off to enjoy today :) ... while I go bask in the afterglow 'someone' just made my day ....Thank you ! 'Every cloud has a silver lining' ! The same goes with the Danish caricatures re. Islam, Muslim but most of all Prophet Muhammad ( hattip Mad Canuck ). Are you shocked ? well don't be and allow me to explain why...after all I did promise to weigh in at least one more time on this subject. Following a week of controversy, anger, questions, diplomatic, embroglio, protests, deaths, childish behaviour, threats and so much more , we have OD-ed on this topic. I think the most shocked are probably the Danes as they seem not to know what hit them. I'm really sorry guys that you had your baptism of fire so to speak (no offense meant) in such a way, though I deplore the torching of embassies and such I think you are extremely lucky that so far only Muslims died accross the world. However, there seems to be a misconceptions at the root of all this, as I mentioned my first post on this sorry issue , the Western world seems to think that Muslims are offended because the Prophet was represented despite a religious edit which prohibits this action. I hate to repeat myself again and state that although this could be technically correct it is not true especially in light of the 'sudden' revelation that an Egyptian paper had already printed the cartoons in October 2005 in an attempt to demonstrate how negative the portrayal by Europeans was of Muslims and their beloved Prophet ( Kudos to Freedom For Egypt and Sandmonkey). I'll elaborate some more but I need to take this in baby steps. First do check a letter by Safia Libyan Muslim in Denmark ( which I found on Khadijateri's blog), excerpts : " I followed the issue from its very start in September 2005; a loony communist writer proposed to fill a wagon with qurans, then shed some menstruation blood on it (his name is Kare Bluitgen) - he declared he wanted to irritate Muslims for fun (he called it ART! )Nobody took him serious and he was ignored for a while. Then suddenly he declared he wanted to make a comic book about the life of our Prophet Muhammed (SAAS). He could not get anyone to draw the book, though. That started a discussion in the newspapers about why no one would draw the comic - Bluitgen claimed that Muslims had intimidated artists from working on the book. When journalist ridiculed him, he suggested to bring some comic drawings in the media to "test" the reaction of the Muslim community. The rest is history... " . She does not feel comfortable anymore and has made plans for an eventual return to Libya. For all the talk about 'press freedom that we have been deafened with, and also the controversy brought up in the comment section about the Holocaust and it being an off limit topic to European ( and western) journalism and press and anyone in this world and it being IRRELEVANT to freedom of the press , I must wonder about this other anectode then and I quote "The Danish daily turned down the cartoons of Christ three years ago, on the grounds that they could be offensive to readers and were not funny". ( courtesy of The Guardian). That just makes my antennaes twich why the double standards dear folks at the Jyllands- Posten ? I still maintain that as published by Jyllands-Posten and then deliberately reprinted by several European papers and taken further by bloggers and even American pundits ( Thank you Mad Canuck again for putting Michelle Malkin in my path ), the intent was and remains to hurt Muslims in an attempt to shake off the very real collective subonscious fear of Islam. My position also remains unchanged that the Muslim world had the right to be offended and seek retribution in a CIVILIZED manner as per the original principles of Islam and not what has been done in its name during the last week. Moreover, I have personally seen and read about these cartoon on a French website back in September 2005, and did not think they were newsworthy or deserved to give them any publicity of credit ( because that is what their owner wanted ). This had opened my eyes from the illusion I had about Denmark, I knew that there was racial problems in France and Germany but did not really worry about Denmark. Now in my eyes all of Europe will be lumped toghether in this same pot - Islam haters at a deeper level than I thought. This sounds so radical does it not - although I am striving to keep an open mind - this is just my gut feeling at the moment. I know it is not true, as I have lived in Europe for years and tons of my friends are Europeans, also I've seen the genuine responses and feelings from Europeans on this blog and on other ME blogs and can evaluate their lovely emotions and sincere questions. I don't, won't and can't blame the European or the West. Why ? because this mess is our own. The issues are beyond being a devout Muslim, the real issue rests in the fact that many Muslims have lost touch with Islam, the real Islam ( but that is not the problem of the West and none of their business, it's the Muslim's to work out on their own). The Muslims however are aware of their deficiency and some are looking for a way out of it. This to me explains why the Egyptians did not rise and riot when the Danish caricature were published in their own press - because simply not enough people from the easily influenced simple mob read about them. You can ask the Sandmonkey himself :) , who reads the papers in Egypt ? Is the thrashing threatening mob even litterate ? So the cartoons in Egypt newspapers passed beningnely because only a few thousand literrate people read that Al Fagr issue and understood the implications, which in their opinion ( and mine) would not warrant a boycott of Egypt or that particular paper precisely because it has OPENED their eyes to what for example Jylland Posten thought about Islam ( I'm not going to insult the Danes and say they all think this way). I believe that those Egyptians who read Al-Fagr were satisfied that it exposed this issue. Their sense of offense if any would be towards the Danish paper and NOT their own paper who was doing them a FAVOUR by reporting on this. So I disagree with Sandmonkey when he states that 'and not a single squeak of outrage was present' . SM, the outrage was already expressed by the paper. It is elementary. It would have been the cue for the Egyptian civil society then to move on with steps to make known its outrage overseas, if they they thought they were offended Not doing so was a big mistake. My only excuse to justify their inaction is that we have been used over the decades to being the recipients of abuse and offense from the West for a variety of reasons, and one more cartoon about Islam only comes to increase that list. What many of us Arabs are not used to is how to go and complain and write to your mayor, senator or whatever to stand up for your own rights. The 'ignorant' mob whose only fault is a love of the prophet was blissfully unaware. However, the Danish Muslims, who were raised in a 'democratic' country knew better, and when they did not get the response they wanted from the Danish governement they went to seek the support of good old Saudi Arabia, because they know how influential that would be. I think they did not calculate this hysterical backlash, but only were thinking about getting some cash and maybe diplomatic pressure, and so they stuffed their file to make their case better. Due to the respect and love that Mecca and Medina hold in the hearts of Muslims everywhere, any crazy utterance which comes from a Saudi official would be taken seriously by ordinary Muslims. and extremists alike because half baked knowledge is more dangerous then ignorance. That needs to be changed by the way - as the Saudis ( not the populace) don't necessarily have the welfare of the Muslim world on their mind . The culprits in this standoff are, in addition to the staff of Jylland Posten -who knew what they were doing- the Danish Muslims who went to fan this thing, which was then taken advertised with the petrodollars and that's how the Muslim street FINALLY heard about it and how the extremist exploited the Muslims mobs gullibility. What surprises the Muslim though is the matter of the boycott and that it worked. Though I agree that they were offended and hurt, I will confidently say that the larger part of the hurt was that they realised this was not a simple cartoon , that this was a calculated and deliberate bomb in their face, that is why they went bersek because Islam has replaced nationalism, Islam has become Islamic nationalism- does it make sense? It is equivalent to what many of you have been stating in the comment section that you feel hurt when you flag was burnt that is nationalism right ? Islam has become for many THE nation, and stirs deep feelings of nationalism, enough to go to war. Again it does not in any way excuse the torching of embassies or the death threats. From the images on the Associated Press ( which are 481 up to now) we notice that the only ones bearing OFFENSIVE and THREATENING messages comes from those staged by our dear Muslims brothers in London ( and yes I am sarcastic when I say dear). Because dressing up as a suicide bomber to protest is not a bright idea especially in London; I'm glad the lunatic drug dealer was arrested. Now why was I being a tad sarcastic about our dear brothers in London? because although I don't wish to lay blame on others I would like to say that this whole mess was started by democratised Muslims in Europe ( of course let's not forget that is was after ample provocation by the free press) . Those Muslims in Europe ( the unsettled ones) have a different set of problems then the Muslims in the ME, they have not integrated, they have their own culture within a culture ( not just Islamic culture) and mix up a lot of things in the name of Islam including extremist feelings. I can understand the feelings of the Syrian protesters burning flags and even attacking an embassy, but not those cool placard carrying London Muslims whose messages were chilling. I've said it on many occasions but our Muslim non Arab brothers and particularly our Asian ones are a big problem ! We already have enough problem for a million lifetimes. So being caught between the anvil of the Asian Muslim extremists and the sledgehammer of the Saudi fundies is a nightmare of gigantic proportions. In addition the Western zealots are not a great help either :) if I may say so. I must agree with Sandmonkey on this though "Now while the arab islamic population was going crazy over the outrage created by their government's media over these cartoons, their governments was benifitting from its people's distraction. The Saudi royal Family used it to distract its people from the outrage over the Hajj stampede. The Jordanian government used it to distract its people from their new minimum wage law demanded by their labor unions. The Syrian Government used it to create secterian division in Lebanon and change the focus on the Harriri murder. And, finally, the Egyptian government is using it to distract us while it passes through the new Judiciary reforms and Social Security Bill- which will cut over $300 million dollars in benefits to some of Egypt's poorest families". And so I'm glad that the Libyan people from two measly lone staged protests here and here , and an initiative to boycott Danish products which we don't have that many anyway, have been largely reasonable about this whole process. Plus we only had 2 emails circulating and NO text messages yet ! Ok I'm not forgetting the decision to close the embassy but we already discussed that before right ? Anyway Libya has been more engrossed in the African mini-summit taking place here to try to diffuse the situation between Sudan and Chad, and which resulted in this declaration. On the whole things were pretty reasonable here :). 'Lo Allah Changeth not the condition of a folk until they (first) change that which is in their hearts' [Qur'an :Verse 10 Sura 13- Picktall translation 1997 , p .217]. In other words , only by taking their destiny into their own hands could Muslims ( or any freedom seeking people ) solve their problems and restore their dignity. This should be done by going back to pristine Islam and its pure principles and at the same time using all the tools of modern civil society provided to us by the West. I don't see any harm in that we have given to the world civilization, it is our turn to take from it to grow once again into a brilliant community- it's not like we lack the potential for that. Khadijateri : "while I don't believe that it's right to insult anyone's religious beliefs, I do believe that people should have the freedom to express themselves. Or to attend, or not attend a demonstration". Tyenness: "I mean, if some freakish individuals feel this inescapable urge to prance around making faces and 'nanana' ing kindergarten fashion…well, let them. I don't see how anyone could take offense at something so pathetic.Abu Laban, the Danish Imam who first decided to make such an issue out of this, just exemplifies the extremist idiots jumping on the bandwagon. ". Hanu: who linked to a great article "the clash to end all clashes" , and who also said "The thing was blown way out of proportion and was kept on the spotlight longer than it deserved". The most graceful post and subtle post I've seen spawned by this issue must go though to Nura, who simply quoted from 'The Sunna of the beloved ' a book Dr. Khaled abu el-Fadl , a distinguished brilliant American lawyer and Islamic thinker, commissioned by President Bush. Excerpts: " Permit me my Prophet, my own beloved Prophet, to tell you that I do not know you from the majestic debates of this Conference, I do not know you from the learned lectures of teachers, or from some infatuated delusional dream. No, I do not know you from the books full of sayings you reportedly said, and I even do not know you from all the reports about your life and about your likes and dislikes. I know you from a moment in time in which I fell in love with you. I know you because God taught you, praised you, and honored you. I know you because God comforted you, consoled you, and empowered you. I know you because God loved you. My Prophet, I know you through a heart that loves" . (Thank you Nura & Dr. Khaled for reminding us why we love Muhammad). Now back to why am I grateful for the Jyllands- Posten ? simply because perhaps this crisis will spark another interfaith/intercultural dialogue which would be between peoples this time not the Vatican and Al-Azhar. I've seen you readers numerous in seeking answer. Maybe it would allow us all to understand the other a bit more, correct our mutual mistakes and misconceptions, educate not hesitate to ask questions and maybe learn that what is okay for us can be offensive for someone else, that is that my freedom ends where yours begins. PS I hope I have covered most of what the readers have asked in the comment section I am grateful to all of you for participating and coming here, more specific and personalised replies to your qestions are all here - pls forgive the delay , but we had terrible weather ( Hattip -Khadijateri ) . So internet access was difficult for me; I hope you will come back even after this page in our history is turned, that would be the Silver Lining! Amin. Dear All, just in case you're wondering I'm not ignoring the discussions here. Just need time to combine a proper reply. I do have to pretend I work right ;) ....otherwise I won't have a job over this blogging business . Total Eclipse March 2006 - Libya: Hurry up !!! According to this report , Libya is slowly becoming a prime tourist attraction, as it is “Libya aims to welcome ten million visitors per year compared with the current total of 300.000.”. Hmmm I’m not sure I want to see that many tourists around as then Libya will never be the same. But the future seems to lie in diversification from reliance on oil, especially in view of the US President’s latest call to stop oil addiction. One of the first great tourist events for this year will be the total eclipse of March 29th, and tourism agencies have a deadline of one week left only to get their act together , and visa processing has been speeded up immensely. So if you want to visit you better hurry as places have been quasi sold out on some cruises. If my plan works I shall be watching it too in March. Last week the US President urged his country to become less dependent on oil. This should be possible with technology, so that by 2025 there would be “a 75% cut in US oil imports”. Dear Arab world this is your cue to start doing something for when oil will NOT be a prime commodity. According to this you got 20 years to put your act toghether. So move it now ! I was shocked when I saw the breaking news ticker today over 1000 people are dead. "ان لله وان اليه راجعون"
My uncle and cousin are supposed to take the ferry to Egypt from the ME on Friday, I just realised this NOW ....dear God please let it be not them on the ferry. Please please please .....no one has thought about it yet in the family and I'm not going to ..first will have to be patient to contact their hotel and find out what time they left . Ya rab 2oltof , the other cousin's cellphone who was supposed to meet them is out of coverage . ok I was hysterical - the news is they are taking the ferry from Jordan. But still have not heard from them so hope all is right . Thank you guys for caring. I'm really angry and upset about this whole ferry accident especially that as Sandmonkey says there could be some mess up by the company cover up and betrayal ...this is DISGUSTING (thanks Sandmonkey for putting up). That is so scary I can't imagine the fear and pain of the dying passengers. If the turns out to be true the crew should be sentenced to death nothing less. As for my uncle, we finally located him and the cousin, they are waiting for the ferry from the Aqaba port in Jordan. Alhamdulilah. The Dannish Issue ....had some trouble with Blogger so could not put up the post ( I guess they have been overwhelmed by traffic) + I also have to sleep you know ;) anyway thanks for your patience and here is the update. This is the update on my previous post about the Danish cartoons ; for those who did not get it, basically I said that the newspaper should not have run these carton because apart from hurting the image of a religious icon, they are racist. I also said that although free speech should not be questioned, there is nothing called 'total' freedom , because with freedom comes responsibility. Moreover, on the basis that free speech and human rights are for all, the Muslims should not be blamed for exercising this freedom to be offended- even if that is the only thing they every will do in their respective countries. So the Danes are free to criticise and so are we - that's fair right ? Undeniably there is repression in the ME but that does not mean they have no rights to also feel about this subject and act on it civilly and peaceful (I expressly mentioned that they should emulate the West in their approach to these matters especially that now religion seems to have no place in the West but only civil society. I quote "we should definitely mount a suitable campaign and civil action to prevent this kind of offense from ever recurring again but we have to play the game the Western way".) - but alas not everybody can hold their temper that is a human trait present on both sides. I won't quote from the Bible as many of you seem to find it irrelevant in this debate. I have always been under the impression that boycott is a civilized way to express disagreement. Consequently hate speech by Muslims, death threats, and violence are not acceptable. I also do not think that diplomatic measures by states are a good idea either as they escalate the situation, or give international exposure. Still that is not a crime but only a method, albeit faulty. Calling Muslims retards and moronic ( by some Muslims) in order bow to pressure perpetuates bad sentiments also because it shows only one thing fear of a threat from the West, which is illogical because the ME is always under some kind of threat from the West if it does not concede to their demands ( that may be a flawed arguments but that is how many envision it). Every one on the blogs is getting excited about the Jews, while this time should be about the Muslims. Funnily enough no one picked on the Universal Declaration of Human Rights as Craig said either. What kept happening was what we call in Arabic '7adith torshan' a conversation of the deaf, with many people wishing to impose their own standards on others ( both sides) without stopping to think whether this might be the chance to reach out and actually talk WITH each other not AT each in order to reach a civil compromise that would satisfy all parties involved so that none of them believes they are wronged and perhaps also redress some historical wrongs in this regard similarly to what happened with the Jews. In this regard I would like to point out that the persona of the Prophet Muhammad has been attacked and defamed viciously throughout the centuries by the West and Europe specifically ( Dante , Voltaire , the Church and countless others and others come to mind - thanks Eya). In general one must unhappily concur with an Orientalist like Montgomery Watt when he writes that 'of all the great men of the world, no-one has had as many detractors as Muhammad.' Having engaged in a lengthy study of the life and work of the Prophet, the British Arabist add that 'it is hard to understand why this has been the case', finding the only plausible explanation in the fact that for centuries Christianity treated Islam as its worst enemy. And although Europeans today look at Islam and its founder in a somewhat more objective light, 'many ancient prejudices still remain.' (From Unveiling Islam, by Roger Du Pasquier, page 47 - quoting from W M Watt's Muhammad at Medina, Oxford University Press)”. So neither Muhammad nor God need us to defend them, but yes we feel emotional about it. 'French theologian Sohaib Bencheikh said, "One must find the borders between freedom of expression and freedom to protect the sacred.... Unfortunately, the West has lost its sense of the sacred. "If only it were just the West'. Is it not ironic that the US government found a cartoon in the Washington post OFFENSIVE ? (brilliant Hannibal). "A bit earlier, I read that the Danish newspaper that published the cartoons has apologized for offending Muslims around the world, not for publishing the cartoons, but for offending Muslims. "We apologize for the fact that the cartoons undeniably have offended many Muslims,"' Carsten Juste, editor-in-chief of Jyllands-Posten, wrote late yesterday in a letter on the paper's Web site. He said Jyllands-Posten wasn't sorry for running the cartoons though. As for Vebjoern Selbekk, the editor of Norwegian Magazinet, the paper that republished the caricatures, he too said that he "regrets if the drawings were offensive to Muslims.."
Still a good step forward to defuse the situation. What did some Muslim leaderships in Arab countries do? they reply in civilized steps to also reign in the burning sentiments and call for civilized action, here is the announcement of the World Islamic Peaple’s Leadership (Arabic) for example. Or the essay on ceilings of freedom. Compare it to the hysteria which has gripped the European press, by republishing the cartoons to make a point almost out of strife it seems, they solve nothing but only unwillingly or willingly demonstrate the extent of racism and hatred as Muslims suspected. It does not show any spirit of secularism or civil society or humanism yet they keep preaching to us about it. The standoff between the Muslim peoples and the West hence continues and according to the media and to the blogs it’s like WWIII out there, but in reality it is not. The only looser in this embroglio are the Danish companies. The Arab streets are not ablaze with boycotters and demonstrators who want to ‘defend the faith’ ( thanks Loulou) , that is simply not true. This is despite the calls by Fatah and Hizbollah for marching ( according the Sandmonkey ). The ME, NA and the rest of the Muslim world is a huge space and I don’t see 1.3 billion people reacting crazily ( not even one thousand- so far)– so please stop the media hype and exaggerations. "[...]those cartoons stem from hostility, anti- beliefs and offending shrines, and igniting the spirit of extremism from which the world suffers a lot, as well as enlarging the gap between civilizations, and severing cooperation and solidarity among the peoples, transcending the professional journalistic values, and denying cultural plurality contradicting all international charters and covenants. The Jurists Union of the Cen-Sad Community urged in its statement the need for the intervention of the international community, represented in the UN regarding this racist offense, as well as taking all necessary legal measures, according to the requirement of international charters and covenants, against those who committed such heinous behavior, by all courts, councils, and competent international organizations, and regard such request an official initiation of the law suit presented by the secretariat of the union. The Union also asked in its statement the need for the Danish authorities to apologize to Muslims about that offense, punish the concerned newspaper and the author Viliming Russ. [sic] [this part I know is impossible and does not work the same way as in our world]"
Even the Libyan blogosphere is not interested apart from smokeyspice here. I have said earlier that Libya had closed it's embassy, well my mistake it has not YET closed I should have looked at my own local press not blogs and foreign press, the statement issued by the governement is the following "going to close" is different then CLOSED ( which is a fait accomplit) . Moreover, unlike is some other countries there is no frenzy of mobile text messages and only one lone email so far ( and believe me I’m very popular in real life ;) ). However there is a popular movement by ordinary folks in the world and if they don’t want to eat Danish then it’s up to them. Danish products are still available in our markets in Libya for sale(I checked myself) and no one is preventing access to them so far, but they are labelled as Danish products. Plus anyway they have been paid for in advance to the Danish food company. "Today isn’t just my day. I’m sick, exhausted and working my head off to meet deadlines that have been given to me in a very short notice! Anyway, few minutes after I’ve got back from my lunch break, a client (a foreigner, doesn’t matter what nationality) is at the company door. He came to meet the boss, who was out. So I asked him to wait in my office till my boss arrives. After a quick chitchat I got back to my work and he just looked through the window. Suddenly he strikes me with this question. Client: You must be feeling ashamed of what your people are doing! Eman: Aha, that’s what you’re talking about then! Client: I mean no offence to you, you’re different, you’re open-minded, not like those backward conservatives! are you even 100% Arab? Eman: Well, I am 100% Arab, and I’m open-minded, and I am totally with the stand of “my people” on this… if that interests you! Eman: Listen. I’m fed up of people calling us different kinds of things just because we stand for what we believe in, just because we stick to our principles. And you know what bothers me the most? It’s when people from within us: Muslims, and Arabs feel embarrassed because some of us spoke up! Client: I’m shocked! You! I thought you were different and tolerant! Eman: I am tolerant, you are NOT. I am open-minded, you are Not! You lecture us about how we should live, how we should act, what we should say, and how we should react, but you free yourselves from every restriction in the name of democracy, and if we speak up you ask us to mind our own business? Client: So now you are the civilized, democratic ones! Eman: No, we still have a long way to go. But there’s a very fine line between democracy and racism; between freedom of expression and disrespect. I might not totally agree with punishing the Cartoonist himself, but I am definitely with drawing lines to the relationship with any country that humiliates our religion. You’re free to express, and so are we! Client: But it was just a cartoon for God’s sake! Eman: We -as human beings- have the right to object and protest. In your country, you have the right to sue someone if they used your name or picture without your permission, let alone use it in a racist, humiliating way! Eman: But what? If I start drawing silly cartoons of your mother and humiliate her worldwide, would you still be friends with me? Client: but it’s different, it was just a dead prophet! Eman: To you, may be, to us he’s someone we look up to, someone we refer to, someone who’s always alive in every verse of Quran we read, in every school we go to, in every home we live… insulting him, is insulting me and “my people”, we’re not asking you to believe in him, but why humiliate him? If you insist to insult, go ahead, but you can’t force me to ignore the whole thing and act as if it didn’t happen, I’m free to feel disgusted, offended, and hurt! Client: Hurt! What about terrorism! Eman: What about it? You think you are the only ones suffering from it, we don’t? Client: So you’re victims now! Eman: No, and neither are you, we all have victims and criminals, we as Arabs have people who are such a disgrace, and so do you. The important thing is that we respect our differences and cultures. Client: You’re right, but still I believe we’re free to choose the means of expressing ourselves! Eman: You’re right, but still I believe we’re also free to choose the means of expressing ourselves equally! Client: Now that I think of it, your people’s reaction does not sound so weird! That doesn’t mean I’m condemning the cartoonist. Eman: I’m not asking you to, and thanks for listening to me. Client: Thank you for explaining. Boss: Sorry for the wait! Client: Actually, I thank you for the wait, we had quite a discussion on the cartoonist issue. Boss: What cartoonist? Ah right, the poor guy! Boss: He just drew few cartoons and boom attacks come from everywhere, I feel so embarrassed, really! You must think we are all backward bastards. Client: (stands up, puts his hand on the boss’ shoulders) In fact, I believe as tolerant people, we should respect each other’s races and religions. You totally have the right to feel humiliated. Boss: (walking away from my office) I will kill him if he just thinks of it, anyway…. Client: (looking back at me) I was right, you are different! (smiles) "
You don’t read/watch the news for a couple of days because you have other more important things to take care of and when you come back to the world what do you find ? The Muslim world and specifically the ME and NA in arms about the Danes, and the Western world in arms about Hamas’s democratic election, while the Iran -nuclear cliffhanger still has us holding our breath ‘will the US go to war (which is what it looks like 99%) or will the Iranians be cunning enough to avert the US wrath once again and deflect it on someone else? Or what is going to happen to Syria?’. Please dear world give me a respite, I need to write the other posts I promised my readers, and not strive to catch up with current hot topics!!!!!!! I’ve decided to get involved because primo I can see from your IP addresses that many of you dear European friends especiallly are expecting me to say something on this topic ( I can see you ) . Segundo, I got one of those forwarded chain emails to my work email from a friend urging me to boycott Danish goods and tertio I find out yesterday that Libya has closed its embassy in Denmark over this issue. Now when actions start to be taken at state level, things have definitely become serious and need time out for reconsideration. The silver lining in all this is that I don’t think we shall get carpet bombed by the Danes for that…. on second thought we might ..oh what the hell , we will all have to die one way or another. But this is out of topic let’s get back to what I was trying to say. So what did I do with the email? well you know there is a preview option (without having to open the email) I clicked on it and found out that this was originally forwarded by someone from the UAE, ok I did not need to see more, I deleted the stuff on the spot. I don’t think that work areas should be sites for political debate or campaigning. I also phoned that so called friend and asked her to refrain from sending me inflammatory material especially at work. I don’t want to get arrested either for her stupidity, people sometimes just don’t think! I won’t repeat Sandmonkey’s words that they are ‘retarded’ . So what seems to be the problem and why has it gotten out of hand? With threats and deaths by extremists Muslim groups as well ? Why is everybody hell bent on proving Huntington’s Clash of civilization right? The problem is compound, complex, and multifaceted, this is not good to start with, despite the way it is portrayed as an attack against ‘free speech ‘ on one side and a deliberate attack on sacred personae on the other, with the truth being lost. I’ve spent some time reading bloggers and readers, and have witnessed the wide spectrum of opinions and counter-opinions and almost lost sight of the original issues, because this has turned into another Islamophobia. Let me try to dissect the problem for you (maybe I will make sense of it finally too). A Danish paper decides to test the boundaries of ‘tolerance’ and exercise its ‘right’ at free speech by insulting ( thanks Michael) the most highly regarded and cherished figure in the Muslim and Arab world. Now with all due respect to Danes, I’m wondering is this a publicity stunt, a carefully planned agenda, or pure venom. I’m ruling out stupidity, because stupidity affects human relations but not in this deliberate way. Did the cartoonist really expect that their work will be glanced over? Why do it in the first place if you’re going to put your government in a tight spot, enflame the feelings of millions and issue an apology or apologies ( thank Sandmonkey) later? This kind of action could have been expected from us Middle Easterners and North Africans renowned for our hotheadedness and boiling blood ; but in the cool Nordic spaces? no way. I find it surprising. With a Europe that is reeling and buckling under ethnic, racial , cultural and belief tensions as a large number of its population originates from immigrant stock ( i.e. non-white) this is begging for trouble. I mean if you don’t care about the Muslims in the rest of the world then supposedly you should care about the feelings of your own population since they carry your passport/nationality too. Otherwise in my book you are using double standards and those who do not ‘conform’ to a certain pattern don’t count ( I can already see some smartass trying to put me in my place and accusing me of being intolerant ;) well be my guest that’s why there is a comment section, just keep the profanities out please). Isn’t the paper’s action tantamount to incitement to hatred, when you bear in mind all that is going on in this world, including the heightened sensitivity of Muslims who only perceive persecution after 9/11 ( even if they could be wrong ?!?). I believe that the right of freedom of expression does not exclude the right and necessity to be responsible. Plus let’s not forget the law of physics, ‘for every action there is an equal reaction’. That goes both ways by the way to the Muslims hotheads and to the Western hotheads (I’m not going to say Christians because that is simply not true ..in my humble opinion this is not a clash between Christianity and Islam no matter how much people like to say so and are mixing the deck of cards). So those Danish cartoonist should have put their talent for a worthier cause of which there are so many in this world. Now for the reaction from the Muslim world and particularly the ME and NA, I can understand it , I am very offended myself so are all those in my entourage. But as much as you have been offended some actions are simply out of place. Death threats in Gaza ? what are we terrorist bigots now ? This does not help our image as Muslims. Yes, we should definitely mount a suitable campaign and civil action to prevent this kind of offense from ever recurring again but we have to play the game the Western way. Our mistake as Arabs has been and will always be bombastic pride and arrogance (that’s probably a sin too ;) ). Please be reminded that most Arabs are not your cosmopolitan bloggers , but they are the ordinary people. We cannot assimilate that the rest of the world does not share our way of thinking and no matter to claims to the contrary most are not interested in reaching out to our way of thinking, you don’t do that when you are a dominating civilization .. While we Arabs have not accepted that our civilization though once great (emphasis on once) has waned. So we need to add another tool to our arsenal, think like ‘them’ and emulate their methods of problem solving. It will not diminish our personality, and it will reap us a lot of rewards in winning hearts and minds ™ in the West plus actually winning media wars followed by victory for the causes we are passionate about. We can keep our method of dealing as Arabs for each other, sort of like an internal memo and a circular memo. Until the day we learn to do that, we will keep piling mistake upon mistake, whereby the truth and the right on our side will be turned against us! Us acting stupidly, even though rightfully indignant, does not exonerate the Danish cartoonists and the paper from their grave miscalculations which may carry consequences we know nothing yet of. I don’t wish to be in their shoes with the dead people who are going to be on their conscience. Some of you ask why are Muslims so angry?, ‘we don’t get angry when someone offends Jesus or Moses ( Peace be upon them ), or touches symbols of the church, that’s silly’. My reply is suit yourself if you don’t feel like redressing a wrong, but most offensive material about Jesus is usually by a Westerner. Muslims (especially ME and NA) revere Jesus and Moses just as they do Muhammad, they are certainly not going to ridicule them because that invalidates their Qu’ran and you cannot have that without the other. Some westerners mention that they are called infidels (or kafirs) by bin Ladin types and wannabes and that they [the westerners] did not make a fuss about it? First of all bin Ladin and his ilk do not represent Islam but their own ideology and secondly if we look at it this way does beign called Kafir equate with Jesus being pictured as a killer and terrorist ? infidel or kafir is strictly reserved for non-believers those who have rejected Islam, and obviously Jews and Christians do have a book and are ‘people of the book and believers’ . So no affront has been done here since the persona of Christ has not been dirtied. I’ve read a comment ( on Sandmonkey but can't find the specific link ) where some imam was preaching in Egyptian mosques and calling Christians and Jews pigs and cows, well this guy has absolutely no right to act this way and should be arrested for public insult, he definitely is not talking in the name of Muslims and should be incarcerated or sued, and is a bad believer, using ‘free speech’ wrongly. But mind you this imam has not denigrated our Jesus if you notice. This imam would not be in this world if he did because he would be thorn to shreds by the Muslim masses. The qu’ran says ‘you have your religion and I have mine’. RE. the cartoons again, I’ve seen this issue being explained as the fact that the Muslim should not make representations or statues of the prophet lest they fall into idolatry and that is why those cartoons are offensive. My response yes Muslims are not supposed to draw the prophet and his companions but those cartoons will certainly not encourage them towards idolatry, they are rather repugnant. To idolize and adore someone godlike you have to make him/her beautiful and attractive ( even on the cross) , look at the Virgin Mary and child statues and paintings, that is beautiful not repulsive and God loves beauty. If the cartoonist had tried to draw Muhammad in a ‘normal’ non satirical way they may have committed a faux pas but NOT an offense. There is a canyon between these two actions. On this same vein I’ve seen some bloggers justify the cartoonists' actions and refute this unspoken law about not representing the prophet by posting some calligraphies and illuminations and portraits ( hattip Roba) which represent the prophet and which were done during the Islamic age. I say again yes, but look at them closely again…. Is there anything offensive about them apart from the fact that they should not have been made in the first place ? They clearly depict passages from his life, and if you look closely you will see they are heavily Asian/East Asian influenced. No Arab would dare to do that. And I forgive them for this error because they Muslims applying their own cultural methodolgy to Islam.They have not portrayed the prophet in a threatening, evil, or blasphemous way. So using this as an excuse does not stand, it does not create a precedent to exonerate the cartoonists. Those were Chinese, Indian, Iranian or Turkish Muslims, but they have not insulted the prophet of Islam. Arabs/Muslims have been stereotyped greatly in western media in far worse cartoons ( political and others ) and portrayals for the last 50 years or so and they never complained about that because, that is not offending the sacred religion. Westerners have also been satirically illustrated in Arab media yet never touching sacred beliefs so that is not an excuse to say ‘look at them they ridicule us’. Satire and offending the sacred are different things. As for the so called boycott, well it may and may not work, me thinks it already did since the paper apologized. Libya imports a lot of Danish products so I will miss the cheese and other dairy stuff, but thank God for other choices, I’ll go check today the state of the supermarkets. When in the name of democracy and freedom of expression a state cannot interfere to clear the good name of a religious community by asking the offender to apologise, that opens the doors to attacking the human rights of others as stated in articles 18 and 19 of the Universal declaration of human rights . Because the other party which feels wronged must not be begrudged also its ‘human rights ‘ and ‘freedom of expression’ to seriously contend the cartoonists action for example. My criticism is however leveled at the way used to respond to this onslaught of hate on Islam, not at the fact that it took place as everyone is free with their opinions. Thanks to these cartoonists and hot headed Muslim counterparts the wick has been kindled, and the fire may run unchecked and engulf everything in its way… if we don’t do something to stop this there will soon be no humanity; especially if other nations decide to jump in to champion this cause. Dear Muslims and dear people of the ME and NA, please don’t give the chance to your enemies (wherever they be) to laugh silently at you shooting yourself in the foot, you HAVE THE RIGHT to do something, take your time but do it with grace and brains. Your ancestors have done it before, I’m sure you can do it again. Amin .